Of all the DC shows, I didn’t like the ending to The Flash because he was gone and it feels like we’ve been here before where he goes, he returns and he’s not the same person. I like Wally, but don’t like Kid Flash. So I’m on a downer before we even begin this one. We’re off to a good start with this new villain after Flash and I was impressed with Kid’s Japanese language. It’s been six months since we lost Barry and now with a 24 hour deadline, Cisco has a plan to get him back, I love the convenience if anything else. Nice nod to Felicity and Curtis, but I’m damned if I can remember who Tina is. Now we have Barry back, he’s talking gibberish, I’ll give it another ten minutes until they figure out what is wrong with him. It’s great to see Caitlin back working alongside Cisco. Barry is back and the chase was pretty awesome. The brains behind the samurais robot looked like a Borg from Star Trek and that’s one hell of a compliment, I look forward to seeing who and what this can do. I love Wally and Kid Flash. A big part of that is because I love how tall, gawky and adorable he is. That bugged me. But it's typical. but I’m damned if I can remember who Tina is. I'm realizing that I am not a huge fan of season premieres. Both Supergirl and Flash's opening episodes were fine and did what they need to do to get things set up for the season, which I know is necessary. I just want to get on with the season. I'm realizing that I am not a huge fan of season premieres. Yes, and it's probably worse when there's a cliff-hanger that threatens a life or changes the direction of the show, as was this case with The Flash. We were led to believe The Flash was gone and within 25 minutes he was back. I really enjoyed the opening scene with the guy in the lift. That was quite dramatic for this show. Barry watching Game of Thrones through some speed tech that Cisco gave him brought a whole new meaning to binge-watching. Not impressed with the counselling Iris wanted, she knows who Barry is, she knows what his life is and she seems to be the one with the issues because he saved the city and left her. I’m just not interested in this kind of direction for a superhero show. And I don’t need the fake tears/emotional acting in this way either. The battle with technology guy was great. I found this episode more engaging than this week's Supergirl episode. Both episodes had a focus on relationships and while it's not something I really want to be a central focus constantly, I did notice that I care more about the characters and their interactions on this show, compared to SG. I find Cisco consistently amusing. So much of this show, for me, hinges on how charming I find Grant Gustin. The villain's name--Kilgore, made me think of Kilgrave from Jessica Jones. I like that they are using Barry’s return as a reason why more metas are appearing, it kinda sticks with the overall feel that whatever Barry does, it has its consequence. And this particular meta, Becky who creates bad luck is one of the more complicated metas we’ve had with Barry having to be in so many places at the same time, That’s while he’s dealing with his own bad luck. I'm glad Wally is leaving the city, not so much Wally, but more Kid Flash and just as Joe says his goodbyes, he learns he's got another child on the way. I'm liking that they are back to more of a light hearted tone. It seems like that sort of went by the wayside last season. An interesting "big bad" this season. I'm not exactly sure where this is going. I'm sorry to see him go. I hope he is back in the near future. I really don't mind Wally, it's the Kid Flash I just can't take to him. Yes, it's all very mysterious and I hope it stays this way for a while. I like to feel that I have to work hard at figuring out who and what he wants. I hope the elastic man Ralph is staying for the season, I think he's a great character and if we are to lose Kid Flash, then this is a fab replacement. I'd rather have Kid Flash. I found the actor playing Elastic Man sort of annoying. Some cool speedster moves from Barry in this episode--positioning the two gunman so that the recoil from their gunshots knocked each other out, and disappearing through the floor with Iris to escape the bomb. I'd rather have Kid Flash. disappearing through the floor with Iris to escape the bomb. That was fantastic, but I don't understand how he did that. I love that this show does a Christmas episode. 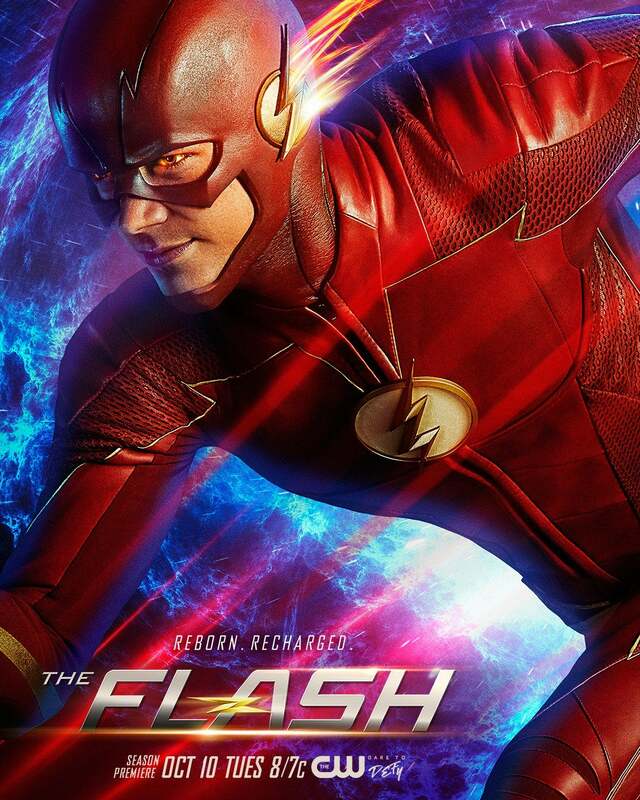 I think both the twist with Barry being arrested for Devoe's murder and Devoe being reborn in a different body are going to take the second half of the season in a really interesting direction. I'm on board with both plot twists. I'm on board with both plot twists. I love this too and it's probably my favourite cliff-hanger of the series. love that this show does a Christmas episode. I do envy how America embraces Christmas. it's probably my favourite cliff-hanger of the series. It was very soapy, which was why I liked it so much I'm sure. I'm assuming this means we are done with The Flash until January or so. Do you think we embrace it more over here than you do over there? I'm assuming this means we are done with The Flash until January or so. Yes, I believe this week is the mid-season finale for all four shows. Oh, totally, absolutely, without a shadow of a doubt. But we are getting better at it with each passing year. I'm really surprised by that, but I don't know why.